Lurrie Bell, the great multiple Blues Music Award nominee and 2014 BMA winning artist for top blues song of the year, will headline the Fifth Annual Crossroads Blues Festival. 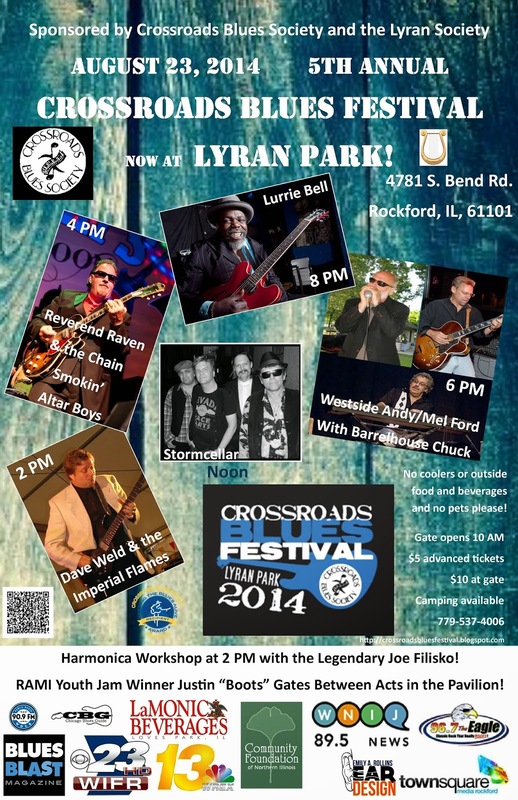 Held for the last four years in Byron, IL, the fest has moved to Lyran Park and will be held on Saturday, August 23rd. Gates open at 10 AM and the music starts at noon. Advanced tickets are $5 and entry is $10 at the gate. 5 and under get in free with an adult. Camping is available for both Friday and Saturday night on a limited basis. $20 per day for campers and RVs, tents are $10 each per day. Lurrie Bell now records on the Chicago legendary blues label Delmark Records and his latest release Blues In My Soul was one of 2013’s top albums. His 2012 The Devil Ain’t Got No Music was also highly acclaimed and featured Lurrie in an acoustic mode doing Gospel and Delta blues in a truly amazing set of performances on Aria Records. He was also a fixture on both volumes of Chicago Blues: A Living History and has a number of great prior releases. Son of the famed harp player Carey Bell, Lurrie has been playing guitar since he was five years old. After years playing church as a youth, he was playing with Willie Dixon at the age of 17. In 1977 he was one of the Founding members of Dixon’s and Billy Branch’s Sons of the Blues. A year or so later he was touring with Koko Taylor. A series of personal demons beset him but they were overcome and he released several albums for Delmark and then released a BMA nominated album with Dad Carey on Alligator Records. He then began recording on his own label, Aria Records and later was part of the Chicago Blues Living History sessions prior to his return to his old “home” at Delmark Records. His recordings and works have been nominated for a host of prestigious awards. Bell goes on stage at 8 PM with his band and they are also some of the best in the blues world. Melvin Smith joins Lurrie on bass. Melvin was Koko Taylor’s bass player and traveled the world with her. He now plays with both Lurrie and John Primer and is one of the greatest bass players out there! Willie “The Touch” Hayes appears on drums. Willie was also with Koko and has played with greats like Luther Allison. He is one of the most respected percussionists around! Roosevelt “Mad Hatter” Purfoy performs a jazz inflected blues style deeply influenced by gospel music on keyboards; he is highly in demand and has performed with many greats. This 8 PM show will cap off a day of blues with four other great bands and two performers. The Westside Andy/Mel Ford Band with Barrelhouse Chuck goes on at 6 PM, Reverend Raven and the Chain Smokin’ Altar Boys are on at 4 PM, Dave Weld and the Imperial Flames go on at 2 PM and the day opens at noon with Stormcellar, a blues and root band all the way from Sydney, Australia! Joe Filisko will hold a harmonica workshop at 2 PM and RAMI Youth Jam winner Justin “Boots” Gates performs between the stage acts over in the park’s pavilion. Call 779-537-4006 for more info! if we buy tickets online, how do we get them?